Don’t just mourn Nelson Mandela. Learn to be Nelson Mandela. He was the consummate turnaround leader. As the first democratically-elected president of post-apartheid South Africa, he took on and reversed the destructive symptoms of decline, a larger version of what goes on in any organization or community sliding downhill – suppression of information, group vs. group antagonisms, isolation and self-protection, passivity and hopelessness. He began the turnaround with messages of optimism and hope, new behaviors at the top (he even cut his own salary), and new institutions that created more communication and accountability. He created a new constitution with a participatory process that included everyone. He reached out to former enemies, visiting the widow of a particularly odious apartheid leader for tea. He ensured diversity and inclusion of all groups in his Cabinet. He brought foreign investment back to South Africa and empowered the disenfranchised black majority to take positions in those enterprises. He knew that he was an icon and shaped a culture for others. His goal was to change behavior, not only laws. The head of what was then Daimler Chrysler South Africa, who had returned to his native South Africa after apartheid ended, motivated a hostile, unproductive black work force by engaging with them in their dream of building a Mercedes for Mandela. This was all about culture, not about financial incentives. People raised their aspirations because Mandela encouraged them. He also understood the power of forgiveness. Despite 27 years in prison, he emerged with his sense of justice intact — but no discernible bitterness. He maintained his faith in people no matter what, that people would come right in the end, he said. His Truth and Reconciliation Commission was a masterful organizational innovation, permitting people to come forward to admit atrocities and then go forward to make a fresh investment in future improvement. He made the rare transition from revolutionary to statesman. He resisted pressure to simply switch roles from oppressed to oppressor and instead focused everyone on pride in the nation they shared and on working together for larger common goals. His wearing of the colors of the formerly all-white rugby team in South Africa’s 1995 victory over New Zealand was a dramatic healing gesture. He didn’t cling to power. He empowered. He announced during the election that he would serve only one five-year term – a remarkable action not only in Africa, a continent riddled with corrupt leaders who refuse to cede power, but also for someone who had waited so long and given so much to reach that position. Some observers faulted him for this, because his successors were no Mandela. But he made his point – that many must serve and become leaders, and that a nation is larger than any one person. He continued to advocate for service after he left office. He asked former U.S. President Bill Clinton to help bring a national service program like AmeriCorps to South Africa. That was the start of City Year South Africa in Johannesburg, featuring young people working in schools to improve outcomes for those who had been left behind. 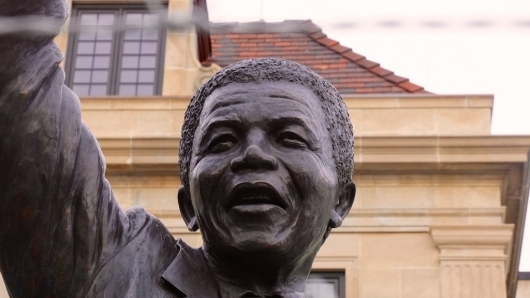 As a City Year trustee, I saw firsthand the positive energy Mandela unleashed. In a mere five years in office, he couldn’t transform everything. But he could start programs and create institutions that would shift other people’s actions to a more productive path. He could serve as a role model, conveying messages through his personal actions and his words about what kind of behavior, what kind of culture, would characterize the new South Africa he envisioned. Mandela’s legacy is larger than racial justice and more widespread than his country or continent. His legacy lies in the lessons about leadership he left for all of us. We can pay tribute by channeling him: Discouraged because things don’t break your way? Consider Mandela’s 27 years in prison. Unwilling to give up the perqs of power? Recall Mandela’s no-more-than-five-years promise. Tempted to crush the competition, eviscerate enemies, or publicly humiliate those who make mistakes? Find your inner Mandela, forgive, and move on. As children, many of us read the powerful, disturbing novel about the evils and tragedies of apartheid in South Africa, Cry the Beloved Country by Alan Paton. Now the beloved country cries for the death of the leader who ended apartheid. Imagine a Mandela for the Middle East, or multiple Mandelas in the African Union. There would be more collaboration, more truth and reconciliation, more focus on common goals rather than divisiveness. That would be a gift for the world. The best way to mourn Mandela is to start a movement to transform the culture of leadership, and ourselves.